In case you’re wondering, this post isn’t about ‘hos. I can’t actually imagine what would propel me to write a post like that, humorous as it sounds. In fact, dear readers, today’s post is about water. More specifically, the arduous task of drinking the stuff. People are very divided on whether they LOVE water or HATE water. I am one of those people who can go hours without consuming a drop and I feel fine. It’s not the healthiest for my body and I do know that I feel more awake and alert when I’m properly hydrated, but it is actual work for me to remember to have fluids between my morning cup of joe and whatever I decide to consume with lunch and dinner. I have to put up a sticky note or set a timer to jolt me out of the lull I get myself into when sitting at my desk working. One issue I have is that I am what I call a “compulsive drinker.” If I have a beverage in front of me at my desk, I will continually sip on it until it is gone, especially if there’s a straw, and then I’m aggravated when there’s nothing left. I am not an ice chewer by nature but if I’ve gotten in the habit of sipping on whatever is in front of me, I’ll chew the ice, too. But when my sad glass or cup sits empty, I find myself annoyed that I have to interrupt whatever it is I’m doing to get up and refill it. So I suppose my solution, whether subconsciously or not, has been to avoid making it a habit to keep myself hydrated at all, because I can’t be “bothered” with it. Anyway, after a recent incident of becoming insanely dehydrated and feeling like crap, I decided to make it a priority to drink more water throughout the day. 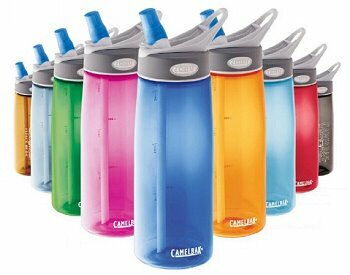 I brought a CamelBak to work in the hopes that it would remind me to drink up. The downsides to drinking water. Yes, there are a couple. The whole bathroom thing. Being hydrated generally means feeling pretty good, except for needing to pee every fifteen minutes. An aching bladder really disrupts productivity in the workplace, though constantly getting up to use the restroom provides a quick reprieve from the office. Still, do you know what washing your hands with antibacterial soap at least twice an hour does to them? I’m going through hand lotion like a person with OCD. Quite frankly, I think the soda business does so well for itself because they’ve made water somewhat exciting, if not completely bad for you. I don’t drink sugar soda and I try to keep a lid on diet soda, because it’s a matter of choosing your poison. Forty grams of sugar and citric acid vs. a nasty chemical called aspartame plus citric acid. There is a reason that Coke can be used as a cleaning solvent, just saying. But I’m not immune to the deliciousness of Coke Zero, Fresca, or Diet Dr. Pepper, three of my faves. Still, I try to indulge sparingly. The benefits of drinking H2O are you feel more alert, your body temperature and metabolism are regulated much more efficiently, and it keeps false hunger away. And somehow it prevents you from being bloated and retaining water, though you’d think it was the opposite. Being dehydrated is the exact 180 to all of the pros, not to mention there is reason to believe women can suffer from a UTI when they get really dehydrated. Gross and ouch! If you don’t know what a UTI is, consider yourself touched by Jesus. I would only wish chronic UTIs on my worst enemy, male or female. I probably won’t ever stop grumbling about getting in my eight glasses a day, or however much I’m supposed to be drinking. But I can’t deny I’ve felt a lot better, bathroom trips notwithstanding, since I began being more mindful of my water consumption. I guess all the experts were right.